Come and fish with us and enjoy excellent trout & salmon fishing in a beautiful part of the Scottish Highlands. 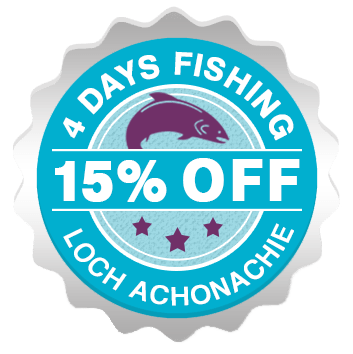 Loch Achonachie Angling Club controls Salmon fishing on the Upper Conon and Upper Blackwater rivers in the Ross-shire Highlands and wild Brown Trout fishing on both of these rivers along with Loch Meig, Loch Achonachie and Loch Scardroy. Amongst our waters you can also find fine Sea Trout, Arctic Char, Perch and Pike. Details of permit prices and membership costs are available here. The club has a membership of over 250 anglers including a thriving junior membership of more than 30. Fishing is available for visitors on all of our waters. A full set of Club Rules can be downloaded by Clicking Here and are also available by post from Okain MacLennan. General safety information for anglers can also be downloaded by Clicking Here. The club makes excellent provision for the disabled. There is easy access to the riverbank in designated areas and a 'Wheely Boat' is provided on Loch Meig. The boat has been custom built to accommodate two wheelchairs plus helpers, making for a great day's fishing. The majority of the club's fishings open on April 1st until the 6th October when fishing closes on all our waters. As always the committee wishes all members and visitors “tight lines” when fishing our waters and we look forward to meeting you at the waterside. The club has introduced its own Gift Vouchers and we can arrange for suitable gifts for Christmas, birthdays and special occasions in values of £5, £10, and £20 or indeed any required sum. These are available from club secretary Mr Okain MacLennan. Fantastic Deals on Permit Packages, click to enquire for more information. Loch Achonachie Angling Club was formed in 1953 by local anglers, to administer the fishings on the Upper Conon, Loch Achonachie, Loch Meig and the Upper Blackwater, on behalf of the then Hydro Electric Board – now SSE. In 1985, Hydro Electric decided to sell their fishings on the Conon and Blackwater rivers and the club was faced with the possible loss of access to the Upper Conon and Upper Blackwater salmon and trout fishing. Starting with only £300.00 in the bank, the club set up a fund-raising committee. Through a number of innovative fund-raising schemes, together with grant aid from Ross and Cromarty Leisure Services, help from HIDB, and a sizeable monetary gift from Lochluichart Estate, the club were able to purchase the Upper Blackwater and Upper Conon Salmon and Trout fishing. The fishing on Loch Achonachie and Loch Meig was retained by Hydro Electric and is let to the club at a nominal sum. Hydro Electric gifted the five wooden boats they owned on the two lochs to the club in 1991. In addition, the club has trout fishing on Loch Beannachrain (Loch Scardroy) at the head of Strathconon, leased annually from the estate owners. The club is formally constituted and an Executive Committee, which consists of the officers of the club and at least 12 other members, conducts the affairs of the club. The officers of the club consist of a Chairman, a Vice-Chairman, and Treasurer. All are elected annually at the AGM held in February and will have previously served on the Committee. The Executive Committee appoints the club Secretary. The club has over 200 ordinary and junior members and 50 life and honorary members. These members reside primarily in the locality e.g.Strathpeffer, Dingwall, Strathconon, Beauly, Black Isle, Fortrose, Inverness etc. but we do have members from as far away as Glasgow, Orkney, Wolverhampton, London, and Germany. Membership is remaining broadly static at present but we always aim to increase the number of junior members over each season.